Browsing articles tagged with " web based app"
If you’re using a web based application like Gmail, Hotmail or Flickr, congratulations, you’re living in the cloud. A cloud app(lication) is a web based application that is usually run through your web browser. The idea isn’t really new, it’s been around since the likes of Hotmail started up way back in 1996. One of the nicest things about cloud apps is that as long as you have an internet connection you can access your data from anywhere. I use all the apps mentioned below, most of them on a daily basis. They all have free options and the majority of them also offer extra premium features which must be paid for. Google’s Gmail has got to be the best web based email application around. So what are Gmail’s outstanding features? At the time of writing Gmail is allocating more than 7 GB of space for each account. It’s going to take quite a lot of attachments to fill that bucket. Gmail’s Spam filtering is second to none. Spam is sent directly to the Spam folder. Gmail’s default setting for the Spam folder is to automatically delete messages that are older than 30 days. False positives are a rarity, in fact in the 5 years I’ve been using Gmail I can only remember a couple of messages flagged in error. If you’re happy reading and sending emails from a web browser, then there’s no need to think about POP and IMAP. On the other hand if you’d prefer to use a dedicated email client such as Mozilla’s Thunderbird or Microsoft’s Outlook then don’t despair, Gmail comes with the option to use either POP or IMAP. My preference is to use POP with the “keep a copy in Gmail’s inbox” option selected. If you want perfect syncing between more than one computer for all emails, then you might want to give IMAP a go. As we all know Google’s main claim to fame is it’s search engine, so it’s no surprise to see a search box within your Gmail account. Searching for messages is super fast, much faster than searching from an email client. Gmail’s serves up ads fairly discreetly. A one liner text ad at the top of the dashboard page and also a few ads on the actual email page. How does Google decide what ads to show you? That’s the slightly scary thing – Google’s robots spider your email and serve up ads that appear to match keywords from within your email, so if you’re looking at an email from Paypal don’t be surprised to see ads for companies like Barclay’s and Lloyds. Like most people, the first office software I used was Microsoft’s Office. One day a friend suggested I try OpenOffice, an open source office suite of programmes that could do pretty much everything Microsoft’s Office could do, but crucially for free! It was an easy decision to make the change, but now in my opinion an even better alternative is available – Google Docs. Google Docs let’s you create documents, spreadsheets and presentations online. You can upload your existing documents and all the popular file formats such as DOC, XLS, ODT, ODS, RTF, CSV and PPT will work. You can create a new document completely from scratch or by selecting a template from Google’s Template Gallery. Working with documents is a breeze, the desktop has a familiar feel and all the normal toolbar icons for normal operations are right where you expect to see them. This feature is just too cool. The ability to be able to create a document and have someone on a remote computer view and collaborate in the editing process in real time is just great. All that’s needed is to select the appropriate privacy setting and then send your collaborator the link. Sharing even allows you to give a live presentation to a group of people no matter where they are. The the beauty of the cloud, you get to store your documents online. All that’s needed is an internet connection and a web browser. Of course if you want to download a copy of your documents you can do that too. Documents can be saved in all the usual formats, such as, DOC, XLS, CSV, ODS, ODT, PDF, RDF and HTML. Organising your work is also very straightforward. You can create Collections which are pseudo folders or directories. Documents can then be dragged and dropped into a Collection to keep everything nicely organised. As we all know when it comes to searching Google excels, so it’s no surprise that searching documents either by title or for terms within the document is super fast and accurate. There are no excuses for losing a document with this type of search functionality. Controlling who can see your documents is simply a matter of selecting the appropriate permissions for a document. All documents are created as Private, only people explicitly granted permission are able to access the document. The other available settings are; Public on the web – Anyone on the internet can find and access the document and no sign-in is required or Anyone with the link – in this case anyone who has the link can access the document without having to sign-in. How do I do that – HELP! Google Docs is a sophisticated range of office suite applications. A huge amount of functionality is available and fortunately this functionality has been well categorised and documented at Google Docs Help centre. You should make the Help centre your first port of call if you need to know anything. Google Docs is a full cloud application. To use it you’ll need to be connected to the internet. There may well be some advanced features that are available in Microsoft Office or OpenOffice that aren’t available in Google Docs. I’ve read that importing heavily formatted Word documents is prone to fail. You’ll need a Google account to get started. If you have a Gmail account then you have an account already. If not head on over here and sign-up for Google Docs. The idea behind Dropbox is that files saved on one computer can now be available on all your other devices, both computers and phones — automatically. Effectively Dropbox lets you take your photos, documents and videos anywhere. It’s also makes it very easy to share those files with your friends and work-mates. Dropbox creates a special folder on each of the computers or phones that you’ve installed it on. Each Dropbox folder is then linked to your Dropbox account. When a file is placed in a Dropbox folder on one computer it’s automatically updated on all the other computers and phones that are linked to your account, but there’s more, you’ll also be able to access your files online from the Dropbox website. This way, if for example, you should lose your laptop while you’re away, you’ll still be able to access all your stuff directly from the Dropbox website. Dropbox does incremental updates of your files, in other words, only the parts of the file that have changed will be updated meaning that it’s less likely to hog too much of your bandwidth. You don’t have to be online all the time. You can use your files whether you have a connection or not. Naturally you’ll have to go on online for Dropbox to work it’s syncing magic. Dropbox is system agnostic, it will work with Windows, Mac, Linux, iPad, iPhone, Android and Blackberry. You can invite family, friends and co-workers to a folder. It will be as though they also have that folder on their computer making collaborating on projects very easy. Changes to files can be seen instantly. Dropbox also has a special Photos folder. Place a new folder inside the Photos folder, add your images and you have an instant public gallery with features like thumbnails and slideshows. Once your gallery is created simply send out the link to anyone, whether they have Dropbox installed or not. Similarly you can send a link to any file that’s inside your Public Folder. How much does Dropbox cost? Dropbox gives you 2GB of space for free. If you need more space than that they have monthly subscriptions ranging from $9.99 USD for 50GB to $19.99 USD for 100GB. You can also earn up to an extra 8GB of space by inviting friends. Each friend that joins will earn you an extra 250MB of space. There have been some discussions regarding the security of files stored on Dropbox’s servers. Personally, I wouldn’t be relying on Dropbox’s encryption methods to keep sensitive data from prying eyes. Instead I’d be more inclined to use an open source encryption programme such as TrueCrypt and store sensitive data in an encrypted volume. Hop on over to the Dropbox website, sign-up and you’ll be on your way to Dropbox bliss. LastPass is password manager, like no other. Once LastPass has been installed it places an icon in the upper right-hand corner of your browser. After logging in to LastPass with your master password it will detect when you are attempting to login to a website. You don’t need to do anything differently. When LastPass sees you logging in it will prompt you to save that password. After the password has been saved, each time you return to that website to login again LastPass will pre-fill your username and password for you. LastPass is perfect for people using either more than one computer or for people like me who use both multiple computer and lots of different web browsers. It works with all the major browsers and is also cross-platform, so it will work equally well whether you’re using Windows, Mac, Linux, iPad, iPhone, BlackBerry or Android. LastPass encrypts all your sensitive data locally. This means all encryption and decryption processes are done on your computer, and not on the LastPass server, because of this sensitive data never travels over the internet in the clear, it’s always encrypted first and not readable by any third parties, including LastPass. Data is encrypted using the 256-bit AES encryption algorithm, which is highly regarded by encryption experts. How much does LastPass cost? All of LastPass’ important features listed above are free, but there is also an option to upgrade to LastPass Premium which costs $1 USD per month. You can see a comparison of LastPass features here. LastPass recently acquired Xmarks. They are offering a bundled option for purchasing both of their premium services for $20 USD per annum. Next to RoboForm, LastPass is probably the world’s best known online password manager. This potentially makes it a target for hackers. If a hacker could compromise LastPass’ security the rewards would be enormous. In fact in earlier this year LastPass did see a potential issue. They reacted swiftly to mitigate the possible threat and kept users informed on the way as can be seen by their blog post here. If you’re looking for password heaven make your way to LastPass and sign-up. Xmarks synchronises your bookmarks across all of your computers and browsers. To make it work you’ll need to install Xmarks on each of the computers that you want to keep in sync. Once installed the application integrates with your web browsers to keep your bookmarks both backed-up and in sync. Once you’ve signed-up you’ll be able login and visit My Xmarks where you can view, edit and delete your bookmarks online. Sync profiles let you separate the different parts of your life. By using sync profiles you get to control exactly which bookmarks are synced to which computers. For example, you can keep your private bookmarks for you home computers, but sync everything else with your work computer or perhaps keep a shortlist of favourite bookmarks for when you access My Xmarks via your mobile phone. Once you’ve set-up your sync profiles you simply assign it to the computers and browsers that you want to keep in sync. You can share all of your bookmarks or a selection of them by creating a shared folder on My Xmarks. You can also choose whether to include sub-folders or not. When you decide to share you are given web addresses for both a normal web page and also for an RSS feed. Xmarks also creates a Widget code so that you can embed your shared bookmarks easily into your own web page or blog. How much does Xmarks cost? All the features mentioned above are completely free. Xmark also has a premium option which costs $12 USD per annum. 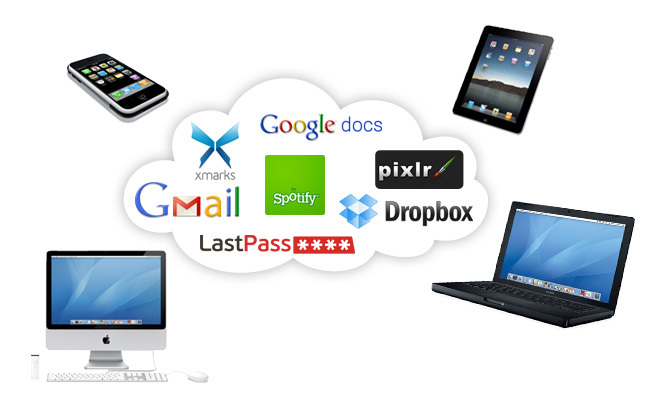 Xmarks was recently acquired by LastPass. They are offering a bundled option for purchasing both of their premium services for $20 USD per annum. Xmarks offers web access via My Xmarks. To be honest the web interface is a bit like the My Xmarks name, severely dated! In my opinion it needs a total overhaul. To get your bookmarks into sync everywhere, go forth and sign-up at Xmarks. Want your music anywhere? Then Spotify is the cloud app for you. Spotify has over 13 million tracks in it’s library and it’s adding new tracks every day. Rather than going through the tedious process of downloading and adding to your own library, music with Spotify is streamed live. Spotify is also coming to the USA very soon. What will Spotify run on? Spotify will run on Windows, Mac, iPod, iPhone, Android and Palm. If you have a premium account, Spotify will also run on Sonos. Spotify recommends a minimum of 256 kbit/s. They say it will work well on a 3G connection, although this isn’t something I’ve had the opportunity to try. Of all the cloud apps I use, Spotify is the only one I actually pay for. They do have a free ad supported version available, but the thought of having my listening experience spoiled by ads doesn’t do it for me. The free service also has other limitations, such as a maximum of 10 hours listening per month and maximum of 5 listen per track. Open – Free: Ad supported / 10 hours maximum listening per month / maximum of 5 listens per track. For me Spotify’s biggest negative is it’s poor customer service. The one time I had a minor issue, I submitted a ticket and didn’t receive a reply for over two days. The advice offered to resolve the problem was way off the mark and in the end the problem went away on it’s own – obviously it was a problem emanating from Spotify’s servers, but one which they didn’t wish to admit to. Spotify also has a Get Satisfaction account which is touted as community based support. The idea is good, but the fact is that Spotify’s people don’t seem to read the posts or contribute in any meaningful way. In a nutshell, Spotify excels in delivering music, but fails dismally at dealing with it’s clients. Fortunately for me the main issues that annoy me (no gapless playback and the occasional annoying nag screen) aren’t enough to force me to leave or prevent me from promoting them as the number one way to listen to music. Whether you like Pop, Punk, Jazz, Techno, Heavy Metal, Classical, Opera or a hundred other genres, then Spotify is for you. Go sign-up at Spotify – you won’t regret it. Pixlr Editor is an online photo editor. It’s interface is very similar to Photoshop and it also has many of the same features. You can do everything from simple cropping and resizing through to using advanced tools like their spot healer and clone stamper. Probably the best way to get started with Pixlr Editor is to head over there and start playing. That’s easy to do as no sign-up is required to use the app. However, if you think you’ll be using Pixlr Editor on a more regular basis then I recommend signing-up. Once you’re signed up you’ll be able to save images to your online library as you work and then download the finished product once you’ve completed your editing. Pixlr Editor is completely free. I don’t see any premium offerings which in some ways is a bit of worry, as I wonder how they’ll survive it they don’t find a way to monetise their site. Pixlr Editor requires that you have Flash installed. Around 98% of people do and even if you don’t it’s very easy to download and install. As the application runs on Flash, the speed of editing will be dependent on how fast your machine is. If things are going too slow you may need to close other browser windows, especially if they contain Flash elements like banner ads. Need to spruce up a few photos online? Give Pixlr Editor a shot. You can start editing right-away by clicking here.